BBC School Report has been running at BDA for the last few years and this year a select group of year 11s have been chosen for the challenge. They are going to be gathering news stories from inside school and the wider world to report back to the students at BDA. This vlog is part one of a three part series documenting the year 11s run up to mocks and GCSEs, talking about how they are feeling about the pressures upon them and how they are dealing with it. Not only is it great for the year 11s to have a voice but it is also an opportunity for the younger years to see exactly what is involved in these very important exams. News day is on 19th March and the BBC will be selecting news stories from across the country to broadcast on every station. In preparation for this, year 11s are also creating a weekly news bulletin for the tannoy on Fridays and collecting news that they think is important and relevant to young people. This week, our BBC School Report team discuss stress, music and travel. A group of talented Year 7 reporters have been working hard to produce articles covering some of the most pressing issues in the UK at present. Click on the links below to read their excellent work (2014). Click here for Hamdi's report on disruptive behaviour in schools. Click here for Felix, Robel and Kareem's report on the closure of libraries. Click here for Ibrahim and Ashkan's report on Islamic law in Britain. Click here for Mariam and Arseima's report on changes to the GCSE exams. Click here for Assamaa and Sara's report on the missing Malaysian plane. Click here for Dua and Maisie's report on the dangers of so-called "healthy food". Please see below for a selection of news stories produced by our team of Year 7 reporters (2013). 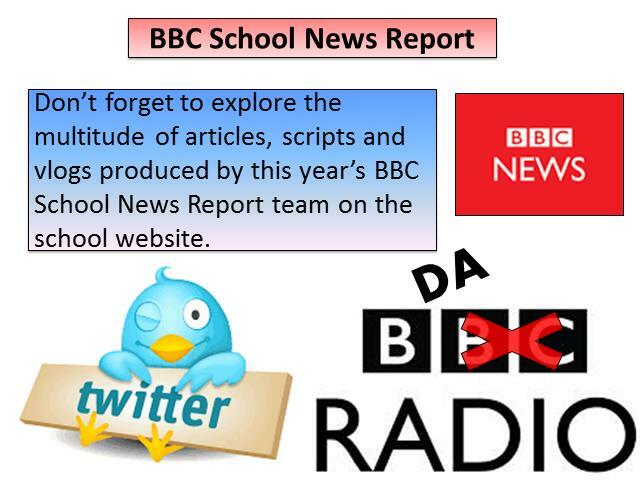 Students from Burlington Danes will be making the news for real on 21 March 2013 as they take part in BBC News School Report. We aim to publish the news by 1600 GMT on News Day, so please save this page as a favourite and return to it later. Click on the links below to read the articles written by BDA students on Thursday 15th March 2012 and Thursday 24th January 2013.